This page contains loads of free teaching and learning resources for download, from how to introduce Moviestorm to your class, lesson ideas across the curriculum, to specific lesson plans created by teachers, for teachers. 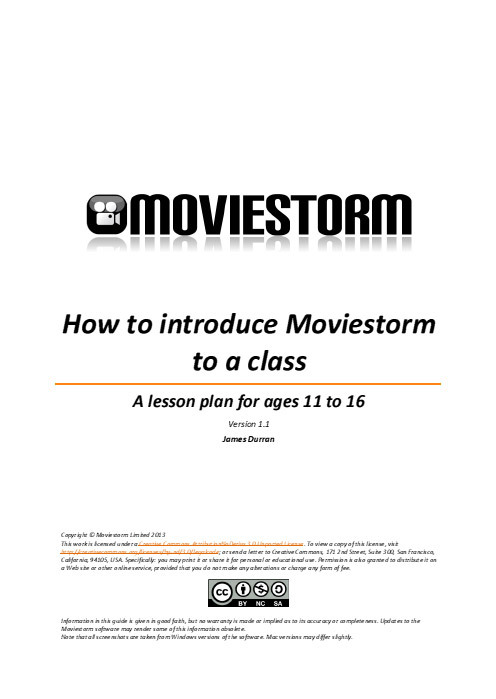 To help you and your students get going quickly with Moviestorm, below are a couple of Introduction lesson plans, created by teachers. It will help if you familiarize yourself with the software and film-making process beforehand. There is a How To and References section in this guide to help you review the main points. 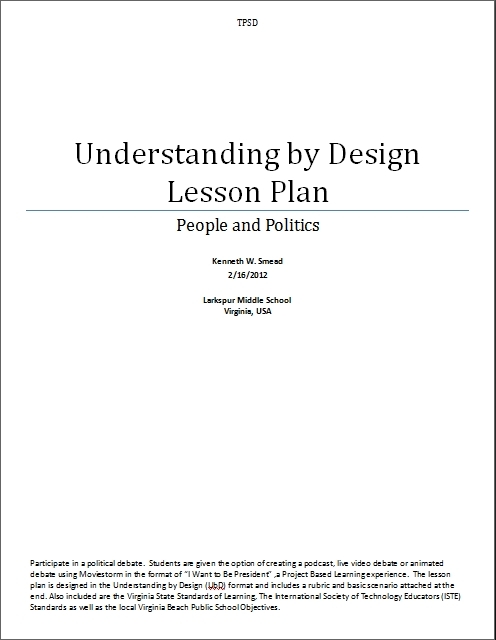 This lesson plan recommends a series of demonstrations and student practice sessions. Students will benefit from spending time between each demonstration to practice that skill, individually, or in teams. 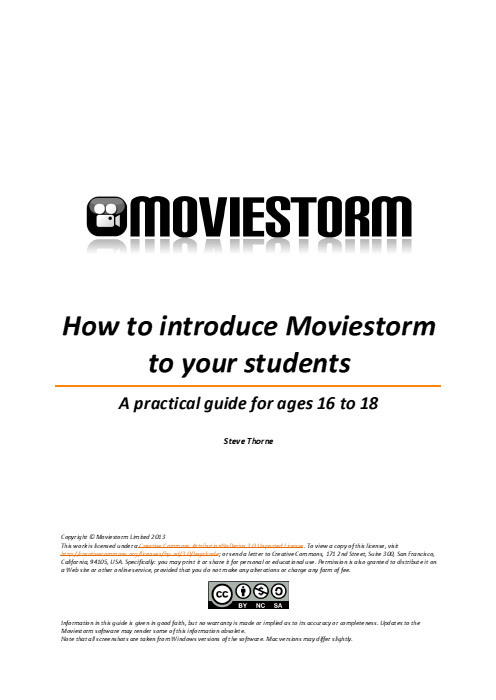 Written by the forward-thinking sixth form media teacher Steve Thorne, this guide outlines how to introduce the Moviestorm tools for the first time, with practical sessions aimed at deliverables that will demonstrate their understanding of the software and the filmmaking process. Students will benefit from spending time outside of class to practice their skills individually, or in teams. Explains the roles in a movie crew and helps you decide who's going to do what. 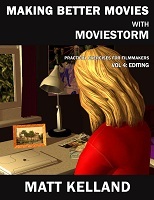 Understand how to get the best out of Moviestorm. Save you a lot of time further along the process. In order to help you integrate Moviestorm into your teaching, our education users have compiled a selection of lesson outlines and ideas suitable for a range of different courses, ages, and curricula. The symbol indicates that there are downloadable resources, typically a Moviestorm file that students can use as part of their work. These suggestions have been developed in association with teachers around the world, educational organisations, and members of the Moviestorm Education Academy. More lesson ideas are being provided by teachers all the time and added to the Lesson Outline resources listed below *. NB Names for subjects or courses vary in educational systems throughout the world, as do the ages at which they are taught and what is considered appropriate. Students create a short 30-45sec clip advertising either a product or a favorite TV show to understand the techniques used by advertisers to manipulate their audience. Take a scene from a set play and present it in movie form. Create a film interpretation of a poem. Review a book. Explain what it's about, and comment critically on it. If it's a classic book, explain why it's significant in literature. Create a short film about a famous author. Tell the story of their life, and explain why they and their books are significant. Create a commercial for a book, and try to persuade people to buy it. * Students recontextualize a hero myth in a contemporary context. They then must find a creative way to present their transformed myth. * Students to show knowledge of novel studied through creation of a book trailer. * Students design sets that suit the spatial needs of the production they are designing for. * Introduce a scene from a well-known Shakespeare play, introduce the basics of using Moviestorm and show examples of the work. * Take a scene from a chapter of a novel and tell the story in modern day language and place it in a modern day setting. * Create an environmental design scape montage highlighting design elements / principles in the environment and a sense of place. * Apply a different genre to a story to understand genres. * To explore representations we can construct through animation and then consider how these affect audience response. Create a short public service announcement about a topic of your choice. The aim is to persuade people to act in a specific way. Create a biographical film about a historical person. Tell the story of their life, and explain why they are historically significant. Present a news show focusing on current events. Make a short film about a historical event. Create a short film re-enacting a historical event. Create a short film about a particular region or place. Create a news bulletin focusing on a major event in history. Create a TV quiz show based on a specific theme, period, or topic. * Using Moviestorm for special needs pupils to "compose" and tell their stories in order to share them with other pupils. Create a video report on a particular artistic style, movement, or period, and explain why they are historically significant. Pick a piece of music and make a video for it. Create and add your own blues music to this topical movie. Create ambient music to accompany a soundscape depicting the seasons. Create a biographical film about a famous artist or musician. Tell the story of their life, and explain why they are historically significant. Make a commercial persuading the viewer to buy a piece of art. It should talk informatively about the piece, its history, the techniques involved and the artist. It should also explain the valuation and make the viewer want to buy it. Film a business meeting in a foreign language. This could be a presentation, negotiation or job interview. Create a TV-style discussion in a foreign language, highlighting different views about a particular topic. Create a travel report from a foreign country, in the language of that country. Create a short film based on a set play. Create a short film based on a set poem. Create a short film in a foreign language, depicting a typical everyday situation that a tourist might encounter. * Create a short film demonstrating the understanding of the basics of programming in C# such as conditional structure. * Create a tutorial video to present a topic. Create a video explaining a scientific concept. Create a biographical film about a famous scientist. Explain the key elements of his or her work, and show why they are significant. Do a weather forecast, using weather data drawn from public records. Create simple videos that demonstrate numbers and simple mathematical operations. Create a short film demonstrating the understanding of some element of basic statistics and how they apply to the real world. Create a short film about a famous mathematician. Tell the story of their life, and explain why their work is important. Create a public information program about the benefits of a good diet, or any other similar positive health practice such as smoking cessation, drug avoidance, or regular exercise. Create a short film on a topic such as bullying or stranger danger. Create a public information program about a topic such as AIDS, sexually transmitted diseases, gender identity issues, or family planning. Create a movie which shows the interaction of a team members during a tactical situation. Explain the rules of a sport. You may choose to focus on a specific rule. Create a biographical film about a famous sporting personality. Tell the story of their life, and their role in their sport. * Create a movie explaining the process of TOTAPS - the method used for assessing soft tissue injury. Create a film about a company or business, explaining what it does. Make a TV commercial for a real or fictional product. Limit yourself to 30 seconds. Create a promotional or informational video about working in a particular job. Create a short film demonstrating interview techniques. Make a video informing students of events taking place at the school. A downloadable version of the cross-curriculum lesson ideas, suitable for a range of different courses, ages, and curricula. These suggestions have been developed in association with teachers around the world, educational organisations, and members of the Moviestorm Education Academy. Study of other languages and cultures increases awareness of the diversity both within and beyond one’s own culture. Communication occurs in various ways unique to each individual culture. Language and culture are interrelated. Cultures influence how people behave and respond to others. Cognates, borrowed words and prior experiences facilitate understanding and communication. Walk into a restaurant or café and get the attention of someone and place an order for food and a beverage using studied food and beverage vocabulary. Democratic governments carry out the will of the people. Political parties and interest groups seek to influence public policy. Media shapes and influences public opinion. Voter turnout fluctuates and reflects the perceived importance of the election and issues. How current events influence public opinion. Describe the process involved in running for public office. Analyze the role of the media in the political process. Assess factors that influence voter registration.